Everyone lives in a watershed whether you live close to a body of water or not. A watershed is the surrounding land that drains into a lake, stream, or river. It includes drainage systems such as ditches and storm sewers, which means you have a direct effect on water quality. 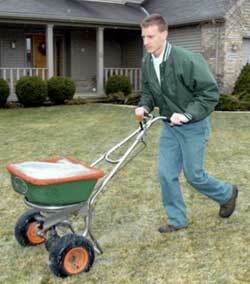 As we welcome each season, many homeowners realize it is time to fertilize their lawn. The grass has endured the seasonal stresses and the cool temperatures provide the perfect opportunity for recovery. The benefits of fall fertilization include a healthier turf before winter along with a healthier root system. Before you fertilize however, think responsibly. Phosphates are a major source of pollution in lakes and streams, and high phosphate levels support over-production of algae and water weeds. Phosphorous comes from many sources such as leaves, lawn clippings, animal waste, and it is in most lawn fertilizers. The Environmental Protection Agency (EPA) has some wonderful videos and publications on Healthy Lawn Care Practices at the following website that you can use to reduce the amount of runoff pollutants in your watershed.